Fire and smoke damage restoration to your home or business typically involves water and flood damage as well, and each aspect requires attention to detail and understanding of best practices in cleaning and restoring your property. Our team is trained to manage these complex fire and smoke cleanup calls with the speed and expertise you deserve. We work directly with your insurance company to help you avoid out of pocket costs, so you and your family can focus on recovering from the fire and smoke damage. A fire can be a devastating situation for you, your family, or your business, so we streamline the cleanup process to put your worries at ease. As soon as the fire is out, give our team at REDS a call at 775-204-2012. We can be on our way in a matter of minutes to start the process of fire and smoke damage cleanup. Determining the extent of the fire and smoke damage, and in some cases, water and flood damage is crucial to the cleanup process. We take the time to go through the property to assess the damage so we can create a plan to correct it. Restoring your home or business to its pre-fire condition involves removing any excess water from firefighting efforts as well as filtering the air to remove smoke. This primes the affected space for cleanup, sanitation, and deodorizing. Using specialized equipment and techniques, our team works to remove smoke and soot caused by the fire from affected areas, including walls, ceilings, and floors. Any areas of your home or business impacted by fire and smoke damage may be restored to their original condition as part of the cleanup process. This includes the removal of odors from smoke and soot as well as repairing any surfaces that were damaged as part of the cleanup process. With each fire damage restoration and smoke damage cleanup we do, our team at REDS is committed to providing a completeness guarantee. You can rest easy knowing that not only will we provide the cleanup services you need after a disaster, but we also put your home or business back to the way it was before the fire took place. We also work directly with the insurance company for payment so you and your family can focus on recovering from the fire and smoke damage. 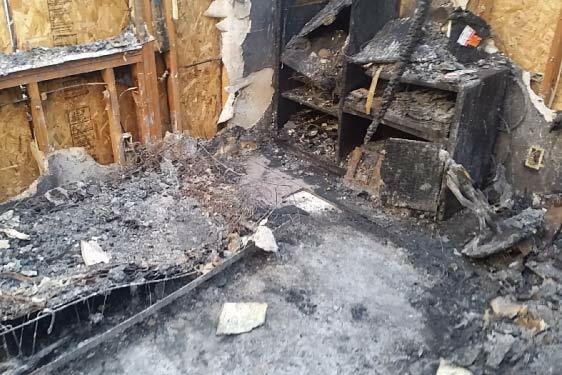 If you need cleanup after a fire, contact the fire and smoke cleanup experts today at 775-204-2012.